Place popcorn in a medium bowl. Spray with a light coat of nonstick spray. Sprinkle with green sprinkle sugar. Set aside. Line a baking sheet with parchment paper. Place dark chocolate chips in a microwave-safe bowl. Microwave just until melted, about 1-2 minutes. Stir until smooth, then spread into a thin layer onto the parchment paper using a spatula. Place in the fridge and allow to cool and harden. Place green candy melts in a microwave-safe bowl. Microwave just until melted, about 1-2 minutes. Stir until smooth, then spread with a spatula on top of the dark chocolate layer. Place white chocolate chips in a microwave-safe bowl. Microwave just until melted, about 1-2 minutes. Stir until smooth, then spoon tablespoon-sized dollops on top of green candy melts. Use a spoon to swirl the white chocolate and green chocolate together to create a flat surface on top of your chocolate. Tap baking sheet several times against the counter to level. Sprinkle with popcorn, green candies, and sprinkles. Place in the refrigerator and allow to cool and harden. Break into bite-sized pieces just before serving. Simple Shortcut: Skip the first step of this recipe by using pre-popped popcorn. Make-Your-Own Bark Combos: Twist up the toppings and personalize your final recipe. Here are a few additional favorite toppings: Pretzels, mint chips, crushed malted milk balls, Lucky Charms™, chocolate sandwich cookies, Muddy Buddies™. Making this treat is SO much easier than finding a pot of gold. Ladies and laddies, I know what you’re thinking: another holiday on the horizon, and you hardly have time to breathe – let alone conjure up clever party bites. Well, have no fear, sweet one! We’ve got your St. Patty’s day party needs covered this year with the WORLD’S EASIEST GREEN DESSERT. Not to mention, it’s the best. Just plum delicious. And minty. And festively green. And it takes just minutes. And makes enough to feed 480,000 leprechaun folks. Or 12 large humans. Or 240,000 mid-sized creatures. Tell me that makes sense to you. So, St. Patty’s Day bark. But there’s an exciting twist! This bark is topped with popcorn. 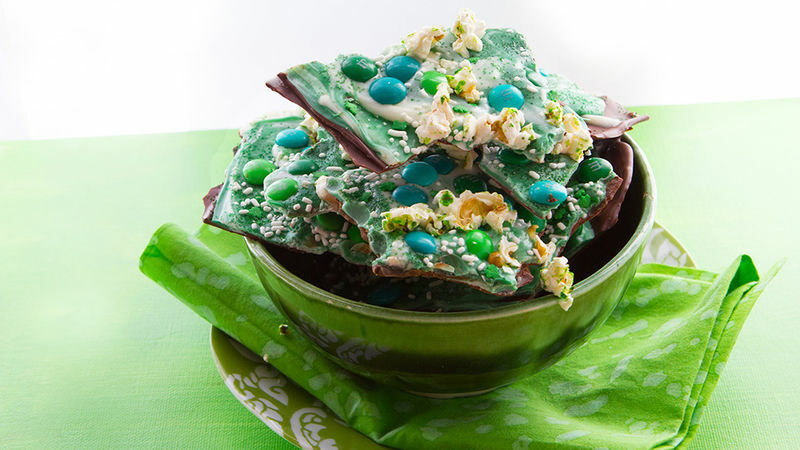 Sparkly green popcorn that adds scrumptious crunch and flavor to the bark. You’re going to j’adore. So we're gonna make that first and have it ready to go. Just pop yourself some microwave popcorn, then spray it with a light coat of olive oil spray. A little green sparkling sugar sprinkled up top and you’re ready to rock this bark. Now ‘tis time to prep your bark. You’ll need chocolate. White chocolate. And minty green chocolate. Or mint chocolate chips. Or mint candy melts. Just get whatever you can get your hands on. You’ll want your lips all over it, regardless the specifics. Le chocolate goes down first. This is really just an invisible layer to offset the super-sweet white chocolate layer up top. If you’re a fan of sweet-and-salty, toss some crushed pretzels or sliced almonds in this layer. It’s up to you. Once it’s spread nice and flat, let this layer sit in the freezer and harden up. Then spread a layer of melted green chocolate. And spoon dollops of white up top, swirling it gently into the green layer. You don’t want to overwork the swirls. The green can be pretty powerful, mussing up the white layer. Once spread, rap your baking sheet several times to create a nice, even, pro-looking smoothness to your chocolate. Now green candies. Guys. You know what they say about the green ones. You’ll need, like fifty thousand of them. Then add your green-tinted popcorn. Now freezer it all again until hardened. It’ll take a good 20-30 minutes to make sure all layers are fully chilled. And now, break it up. So you can make it up. Or, you know, so you can serve it up on a plate like this. Or in a bowl like this. Crack and snack. It’s so a thing!